The heroes arrive in Nal Sagath during the Carnival. On this day, to celebrate their freedom from Tricarnian rule, the local people put on strange costumes and masks, play tricks of all kinds, and there is a general merry atmosphere. The party has some time to enjoy the feast and eat and drink at leisure. The festival reaches its climax with a show reenacting the Princess’s Liberation, in which the Fabulous Princess of Nal Sagath is first captured by the Four Ghosts and then freed by the courageous Mighty Hero. This year the role of the Splendid Princess is played by Dalla, the pretty daughter of Toros, the innkeeper, while Oggo, the dim-witted but very muscular smith’s helper is the Mighty Hero. The play is held in the main square of the town, filled with a large crowd for the occasion. The Princess is sitting on her throne, when four creatures, men wearing masks, burst out of the old temple, kidnap her and drag her back into the sanctuary, amid the spectators’ amused and salacious remarks. This is Sword & Sorcery in it’s purest Fast, Fun and Furious form with a dash of Lovecraft influence thrown in. You don’t need any experience with Savage Worlds or Fantasy Grounds to come crush skulls. You do however need a working mic and TeamSpeak. The publisher of Beasts & Barbarians, GRAmel has graciously donated an exclusive B&B Golden Edition Player’s Guide that will be given to every participants! Also, one lucky player selected by the group will be awarded the full version of the B&B Golden Edition. 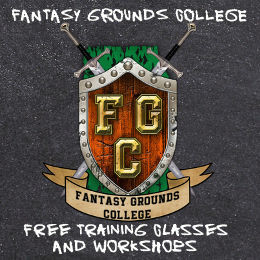 Join the Fantasy Grounds College! April 12th 2018 FG Con 14 begins! 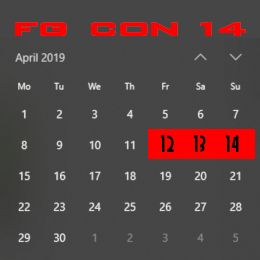 April 14th 2018 FG Con 14 finishes! 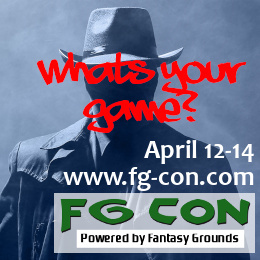 Copyright © 2018 Fantasy Grounds - FG Con. All Rights Reserved. The Ward Pro Theme by bavotasan.com.